Heat oil in a pan, add the cumin seeds,add the onions and fry them until they turn translucent,followed by ginger garlic paste saute well till the raw smell extracts from it. Add the tomatoes, saute it well. Add the chopped vegetables and saute them for a min. Add curd and salt, mix it well , add 1 cup of water to it and allow the vegetables to cook in medium flame. when the vegetables get cooked, add the turmeric powder, chilli powder, garam masala powder and mix them gently. Now allow this to cook for another 10 min. . Note : You can also add vegetables like mushroom and broccoli. If you don't want a dry sabzi add little water and bring it to boil. Hi Aruna, Thank you so much for following and encouraging me! I am looking forward to browsing through your fantastic space, there is so much to look around!! Kadai subzi looks so heartwarming,wish I could eat it off the screen! Ha,Ha. lovely looking subzi and so healthy...and looks colourful...beautiful pic..
Kadai subzi looks yummy and colourful..
slurrrrrrrrrp! very delicious and inviting sabzi. Delicious Sabzi Aruna...Perfect with Roti! wat a gorgeous clik..the recipe sounds fantastic..
good combo of so many veggies.. lovely! sabzi looks inviting n colourful!! wow...Sabzi looks so perfect with the roti. 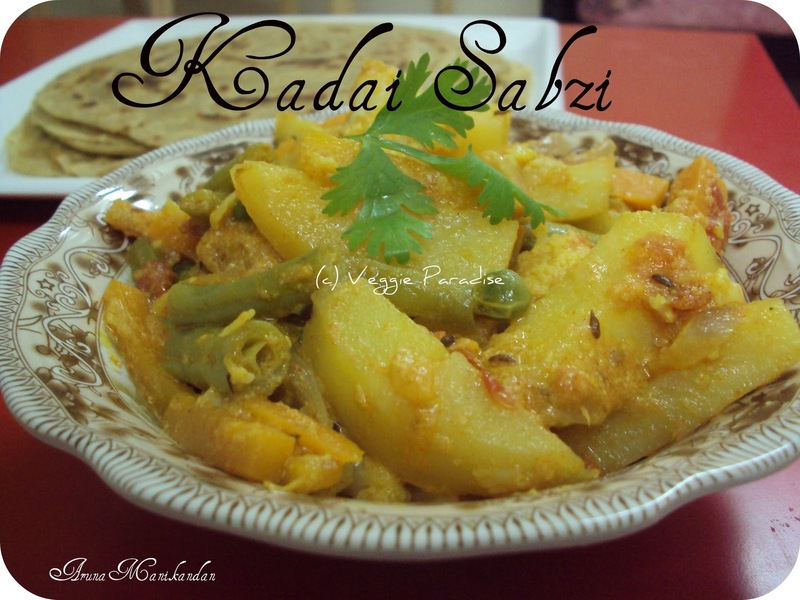 kadai Sabzi looks awesome. Wonderful clicks. 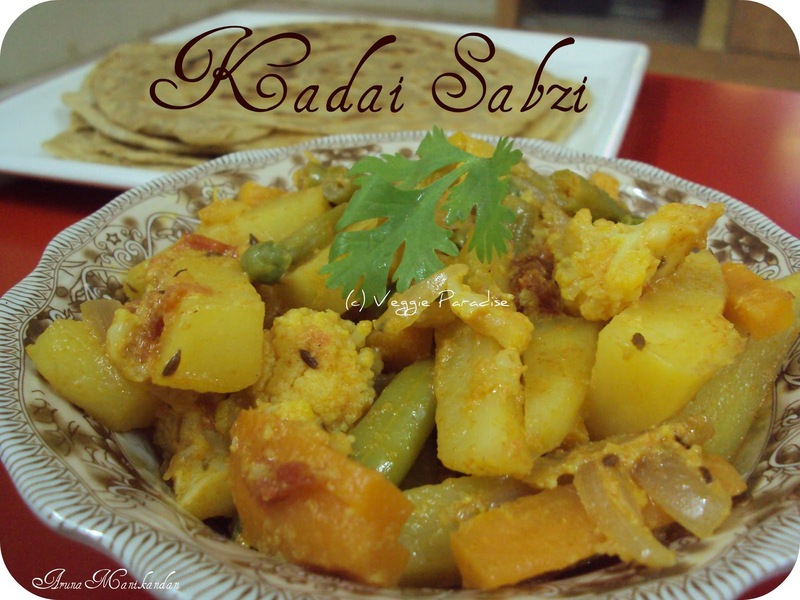 Healthy and delicious dish..Perfect with rotis! This is one of my favorite sabzis, looks yum ! The curry looks very healthy and delicious! Great clicks... Veggies are so inviting! Delicious curry..nice combo of ingredients!